better than i could have imagined: Santa Success! Geoff had the day off today....so we made it another Family Fun Day (we had one the day before Thanksgiving, too, but I've yet to post about it). Anyway......I am too tired to post about our whole day, but did want to share these photos. Parker's first Christmas...she was 3 months old....I was a new mother.....and why would I take my new 3 month old to see Santa with all of those....germs?? (Oh...brother.) Haha. :) Now- I have a totally new perspective.....Germs are good!!! They keep us healthy. (except for when they make us sick, but this is a whole other discussion for a different day). 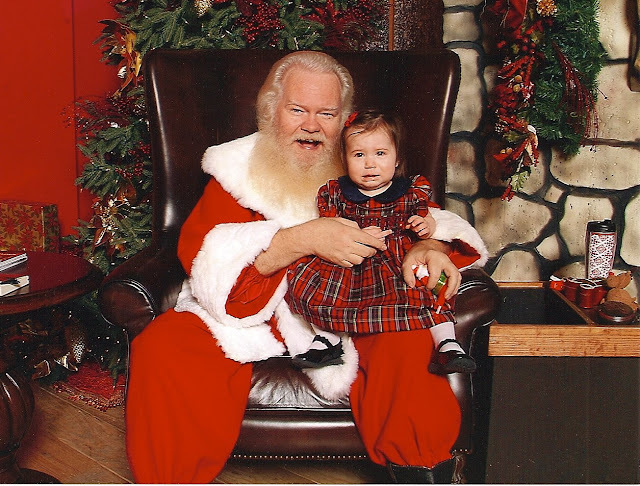 So the first year she saw Santa, she was 15 months old. She did pretty well. There were tears....but nothing too dramatic. 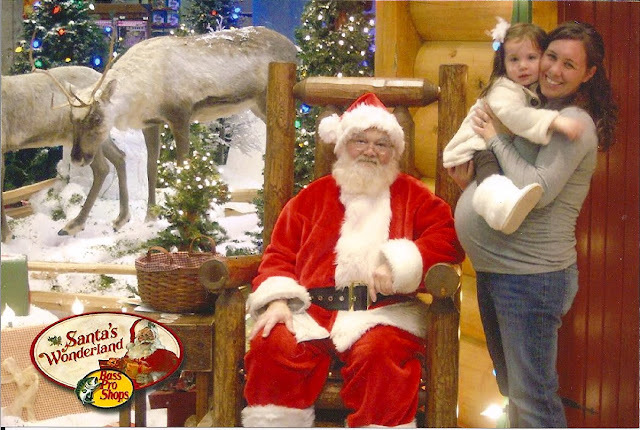 Last year....at a little over 2 years....she acted excited to see Santa before we saw Santa....but when the time came.....there was nothing doing! She was clinging to me and would not sit in his lap! This year- didn't really know what to expect. Kind of thought Parker would be ok with Santa...and kind of thought Grace would be ok with Santa, too, because she is my laid back baby. And I'd say it was all a Santa Success! I had mentioned to Parker a couple of times before we got to Santa that she was going to sit in his lap and was going to tell him what she wanted for Christmas. I asked her what she wanted for Christmas and she said with a smile on her face, "Ummm....lot's of toys!" She walks right up to Santa and just stands in front of Santa and just starts talking. She had business to take care of and she was not wasting any time at all! We may have gotten a picture of this, but I have not uploaded the pictures yet. While all of this is happening....Geoff is holding our camera....I'm still trying to push the stroller up the small ramp, sweating, and trying to hold my wiggle-worm 10 months old! I look up and see this and rush to get our Flip video out of the camera bag. Of course....it took me forever to get out...but I did get some video....which I will hopefully post soon. Santa finally got her in his lap and she continued to tell him all that she wanted (too bad I couldn't hear what she was saying! )......they started to try to take pictures and she just had this blank face. 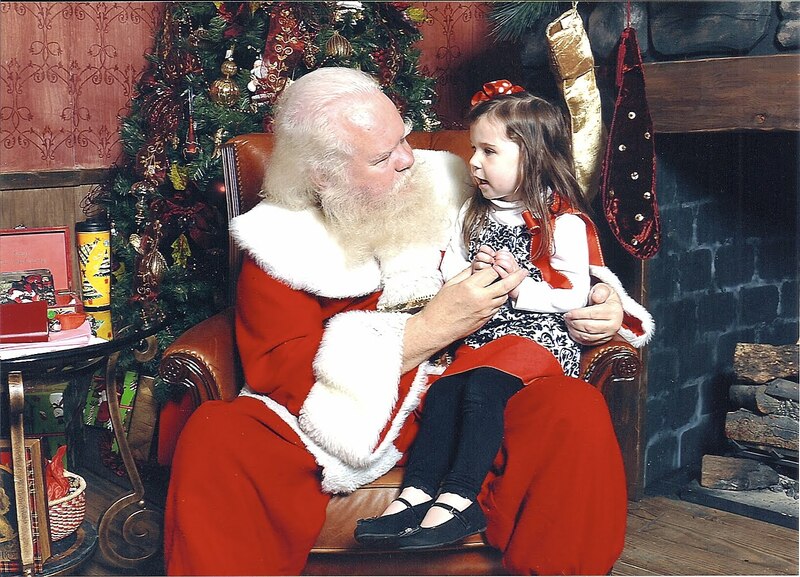 And even after we tried to get her to smile....she continued to talk to Santa. 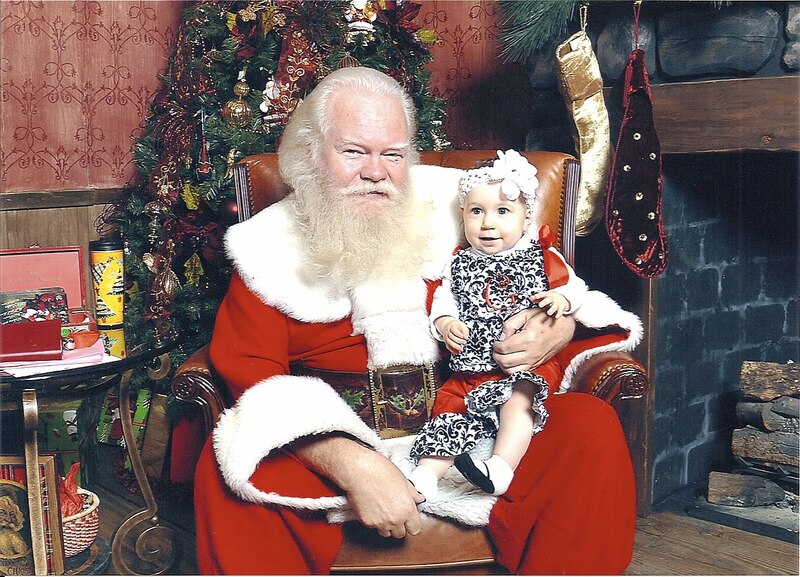 So we decided on this picture.....because this picture really captures her visit with Santa. To her....she was really visiting Santa....not just this crazy, photo op that some of us parents (including me) thinks is so fun and important, you know? Now onto Grace. I just had this strong desire to have them sit with Santa separately. I would love to have one of them together, but I just felt like they deserved to still see Santa alone. Luckily- the photography saw it on the ground and handed it to me. I quickly put it on her head....and placed her in Santa's lap....my thoughts being that once she was in Santa's lap, she'd be so distracted she'd leave her headband on.....and score! She did! A couple of times she looked like she wanted to cry, but with the help of an Elmo doll and the young photographer....we got this sweet smile! Our visit with Santa was great! We may try to go next week with Aunt Sis and Payton...and I think I'll try to just put them together for this one. The deal is (and it's kind of funny)...I think I'll enjoy it more because the pressure will be off to get the picture with Santa. And with all of that being said. Who really cares? How fun! We are taking John out for his birthday tomorrow and friday...and sat and sun! haha! :) Maybe a weekday trip to Northpark to see Santa and the trains would be fun. Thanks for the idea! Parker was great telling him exactly what she wants I'll bet, just loved the look on her face so intently telling him, Grace was a little doll baby as usual too. Loved them! Parker did look like she was just filling him in with all she knows!! HA!! And Grace too cute, smiling!! Glad it was a success! Can't wait to go next week! I love the pictures. We are also going there to see Santa and "my dad's train" he was given one in honor of him. Lets hope we get good pictures.